Editor’s note: Sometimes it seems like pundits and reporters are incapable of writing about bicycling without falling back on words like “sanctimonious” or “European-influenced.” Many of New York’s political representatives likewise seem incapable of grasping how safer streets for cycling would benefit their constituents. Streetsblog could write endlessly about the point-to-point convenience of cycling, how bike infrastructure complements the transit system, and why it’s no coincidence that in a city where 54 percent of households don’t own cars, 54 percent of voters support the expansion of bike lanes. But nothing can cut through anti-bike noise quite like New Yorkers who ride, telling their own stories. 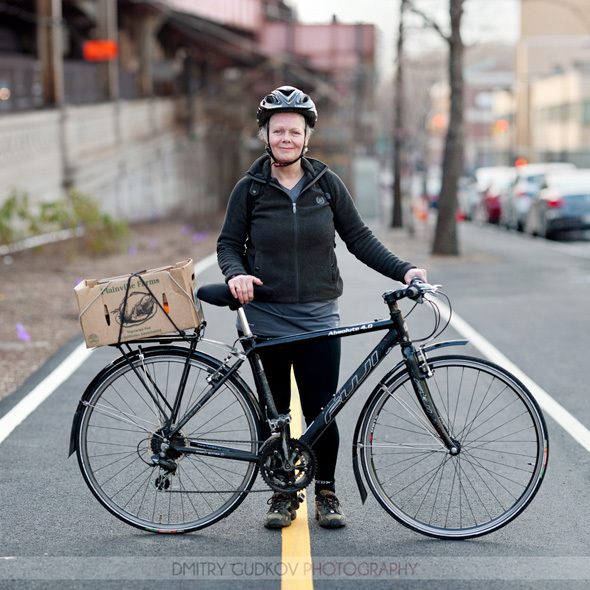 Photographer Dmitry Gudkov has been putting together profiles of NYC cyclists since last spring with his #BikeNYC portrait series. Dmitry’s subjects ride for many reasons, and as far as I can tell not one of them has said they do it to stigmatize motorists or feel more Continental. Streetsblog is pleased to announce that we’ll be publishing Dmitry’s profiles in a new weekly feature we’re calling “Why I Ride.” Here is the first installment. You can see more of his work at GudPhoto.com. Copyright Dmitry Gudkov, used with permission. Originally from England, Sally lives and rides in New York. Her commute takes her from her home on Roosevelt Island to Midtown, where she works as a textile designer. While she has been a bike rider all her life, she didn’t begin bike commuting in New York until about a year ago. Besides the health benefit, one of the main reasons for the change was that her commute on the F train became increasingly unpleasant and unreliable. She would often have to wait for two or three packed trains to pass before she could board. With the encouragement of a bike messenger friend who helped ease her into New York cycling, she now has a reliable commute that takes 25-30 minutes on an average day. How about a “Why I Drive” column! But wait? Isn’t she European? No one really feels this way, as we all know. This is just the right’s way of “liberal baiting” us and only appears to play to some conservatives’ fears of losing status. Someone else mentioned this early – now they can’t make fun of cyclists because they’re no longer just hipsters, lycra clad freks or the poor. Now “normal”, even legitimate, people are biking. If anything, this constant harping on “elitism” seems to point more to the harper’s feelings of inferiority more than any feelings fo superiority on the harpees side. First, that’s a great looking bike! Second, does anyone have any thoughts about whether it’s easier to take the bike aboard the tram or to loop all the around via the QBB and the Roosevelt Island Bridge? I’d say the two bridges are easier, but that’s just me. I don’t think Brits consider themselves European, but I’ll defer to them, as I was born on the Continent. Another one of Dmitry’s great photos is an excellent way to end the week. Great idea to make them a regular feature. Dmitry’s photos are proof that a picture is worth a thousand words! That might as well have been my story. Middle aged person. Had trouble getting exercise, and expected doom for the transit system. Knew how to ride a bike but didn’t think it was practical for commuting. Looked into it, tried it, and found out different. The reason most people commute by bike is they would either be embarrassed to do it given its social stigma, or do not think they can, or are afraid of being injured or killed by a motor vehicle. Take these things away, and the number of people traveling by bike goes way up. If everyone who might like to travel by bike did so, it would be much, much higher. Law of Attraction worked wonder for me. Thanks Brendan, you always deliver and keep your promises. I drive because I can’t stand the idea of not shelling out all my cash for gas, insurance, repairs, and parking tickets. I love the way my car gets more and more crumpled as people constantly hit it while it is parked. I love killing a day the impound lot to be bled a little more. I drive because I thrive on the constant seething anger exuded by every other driver on the road. I drive because I get so much pleasure from alternate side of the street parking. I love getting stuck behind a garbage truck, especially on a hot day. I love every slacker friend expecting a ride to their home in Bay Ridge or Midwood, like I have nothing better to do than shuttle them around and burn up more gas. I drive because I love traffic, especially in a tunnel or on an overpass. I drive because I refuse to do the simple math that would prove that my cost per mile would be lower if I literally took a taxi everywhere. I drive because If I didn’t spend so much money on my car, I’d be rich! So I drive to keep myself poor and humble.